Pelorus Sound is the largest of the sounds which make up the Marlborough Sounds at the north of the South Island, New Zealand. The Marlborough Sounds is a system of drowned river valleys, which were formed after the last ice age around 10,000 years ago. 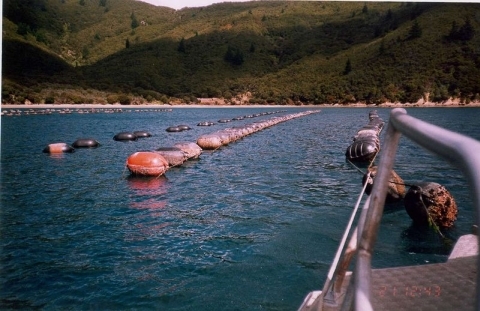 Pelorus Sound has a main channel which winds south from Cook Strait for about 55 kilometres, between steeply sloped wooded hills, until it reached its head close to Havelock town. Pelorus has several major arms, notably Tennyson Inlet, Tawhitinui Reach, Kenepuru Sound and the Crail/Clova/Beatrix Bay complex. 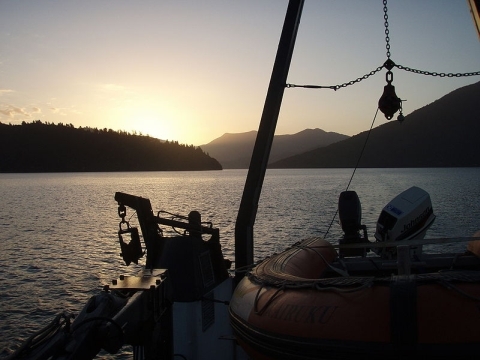 Industry in Pelorus Sounds is based around marine farming, pine forestry and some tourism. Private holiday homes are becoming more common. 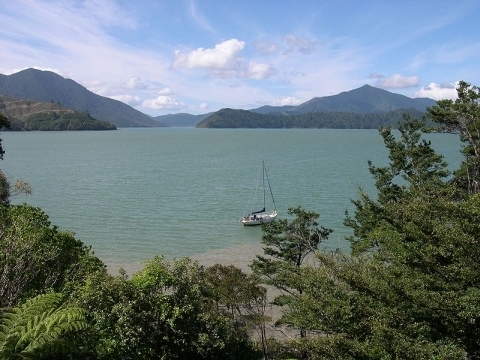 Most of the settled places are hard to reach overland, and are serviced by the Pelorus Express, a mail boat which does three different weekly runs from Havelock. Maud Island, originally called Te Hoiere in the Māori language, is a 310 hectare island in the Pelorus Sounds. It is an important nature reserve to which only scientists and conservationists have access. The local iwi (tribe) of the indigenous people of New Zealand is the Ngāti Kuia. According to Ngati Kuia oral tradition, their founding father, a descendant of Kupe, came to the South Island in his waka Te Hoiere. In 1642, Abel Tasman sailed past D'Urville Island, French and Russian explorers followed and in the 1770s Captain James Cook arrived. 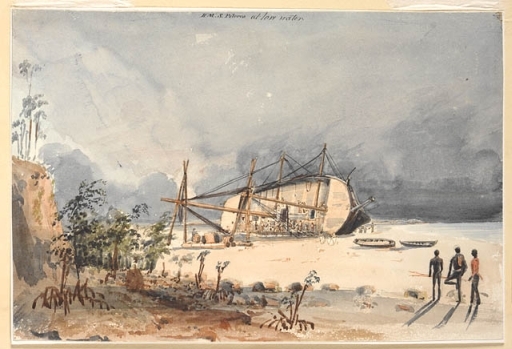 In 1838, Philip Chetwode in command of the Cruizer class brig-sloop, HMS Pelorus, carried out the first survey of Pelorus Sound. The sound was named in honour of this survey. A pelorus was a navigational instrument used on sailing ships. The instrument, in turn, was named after the pilot for Hannibal, circa 203 BC. In 1864, gold is discovered in the Wakamarina Valley. For a brief time, Havelock becomes a boom town as several thousand prospectors flood the area. In 1865, the first timber mill started at Mahikipawa, an upper arm of Pelorus Sound. More mills were established, and native timber was shipped around New Zealand and to Australia. By the turn of the century the timber camps had largely given way to dairy and sheep farms. In 1939 the last mill was closed. About 325 million feet of timber had been sawn over a period of sixty years, and only two small areas of native timber remained. In 1888, a Risso’s dolphin appeared in the sounds. This dolphin became famous as Pelorus Jack and became the first dolphin in the world to receive the protection of the law. Pelorus Jack would accompany boats to and from the notorious French Pass. He would join boats bound for Nelson at the entrance to Pelorus Sound and for eight kilometres would ride their bow waves to Pelorus Sound. He did not go through the pass with them, but would met returning boats as they exited the pass. Pelorus Jack was last seen in April 1912. The lightkeeper at French Pass claimed he found the body of Pelorus Jack decomposing on the shore. During World War II, coastal fortifications were constructed on Maud Island to protect Cook Strait, and the entrance to the sound. These fortifications included a 6in Mk 7 gun emplacement, and range finding equipment that is still there today. In 1906, New Zealand purchased its first naval ship, a sail training ship called NZS Amokura. It became a coal hulk in 1922, and in 1953 was towed into St Omer Bay in Kenepuru Sound, an arm of Pelorus Sound. It was used there as a store hulk and jetty. Reported broken up in 1955, her remains lie on the beach in the southern end of the bay.